June 2012 marks the 25th straight month in which the number of NICS checks made during the month surpassed the number from the prior year. 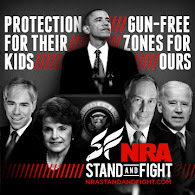 The June 2012 NSSF-adjusted National Instant Criminal Background Check System (NICS) figure of 846,437 is an increase of 24.5 percent over the NSSF-adjusted NICS figure of 679,840 in June 2011. 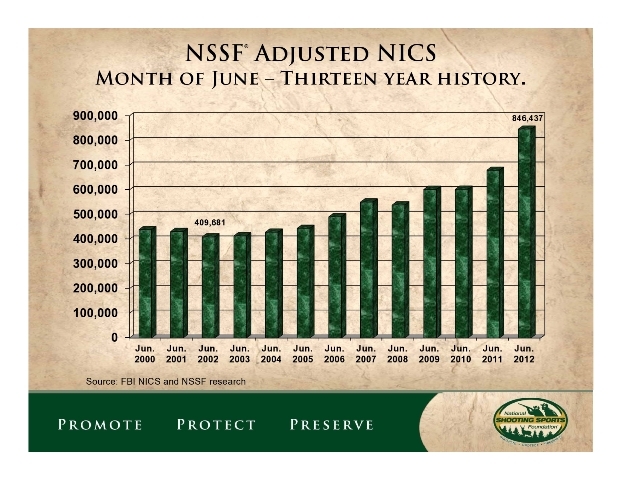 For comparison, the unadjusted June 2012 NICS figure of 1,290,210 reflects an 11.4 percent increase from the unadjusted NICS figure of 1,157,714 in June 2011. 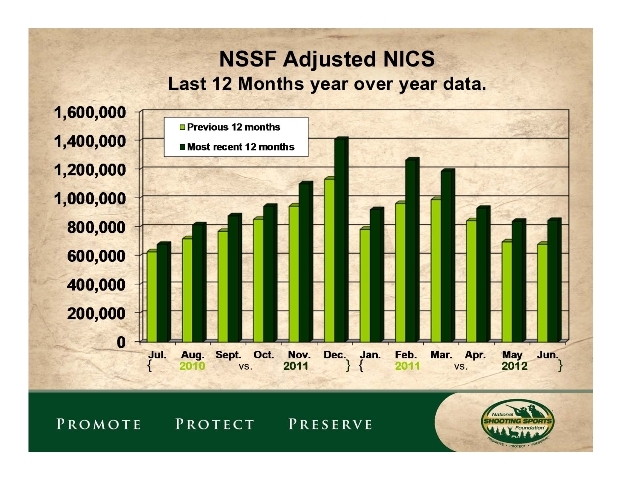 As the NSSF noted, June 2012 was a 24.5% increase over June 2011. However, the difference between June 2012 and the earlier years is very significant. June 2009 and 2010 look to have about 600,00 adjusted NICS checks or a quarter-million less than this year. That is a large difference! It should be noted that NICS checks are not a perfect correlation with firearms sales but are a strong indication of general trends in firearm sales. Some states such as Kentucky, Iowa and Michigan use the NICS system for their CCW permit application checks as well as checks on active CCW holders. Conversely, in states such as North Carolina where the Concealed Handgun Permit is an approved substitute for a NICS check, purchases by permit holders will not be counted. I don't think we can know conclusively if this continuing trend in the increase of NICS checks is due to the fear of an Obama reelection or just the rise of Gun Culture v2.0. I do know that strong sales have been reflected in the stock prices of companies like Smith and Wesson. Today, the stock hit a 52-week high at $9.50 per share which reflects a four-fold increase in share price. A Barely Veiled Warning To Whistleblowers? That's A Good Question, Mitt! Eggs, Caskets, Adoptions, Or Project Gunwalker? Why Is ATF Promoting Brady Campaign Numbers?